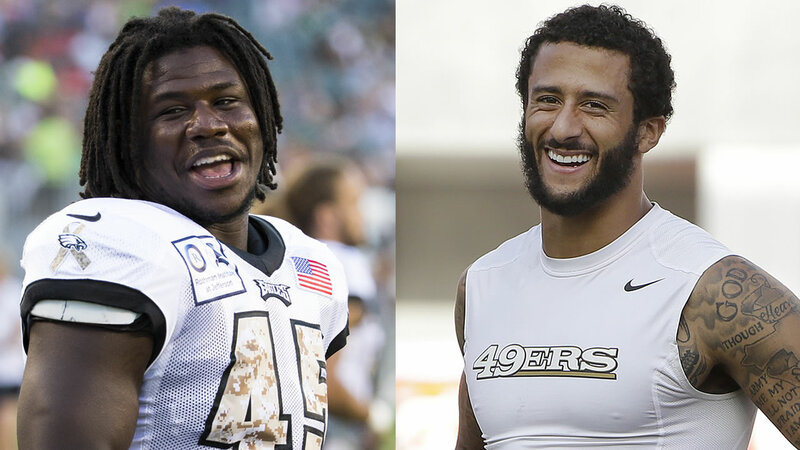 Philadelphia Eagles rookie linebacker Myke Tavarres has reversed course and will now stand for the national anthem Thursday after earlier saying he would sit it out in protest. "He plans on standing for the National Anthem," Tavarres' agent, Corey Williams, said in a statement Monday. "Myke does not want to be a distraction to the Philadelphia Eagles organization. Myke's goal is and will always be to make the Eagles 53-man roster and help the team win a Super Bowl." Asked if he advised Tavarres to change his stance, Williams replied: "Yes, I did." "Oh, I thought about it. Believe me, I definitely thought about it," Tavarres said of sitting Saturday night. "And usually I'm front and center on the line with the rest of the guys, and that's since pre-K all the way up. Saturday's game, I stepped back, I was in the background, and it didn't feel right to me at all, and so I will be taking a stand -- or sitting down -- for the fourth game." Kaepernick has created a national conversation for opting not to stand for "The Star Spangled Banner" this preseason because of his views on the country's treatment of racial minorities. "We've got an issue in this country in this day and age, and I feel like somebody needs to step up and we all need to step up," Tavarres said. "We've got that right. There's just a lot going on that people don't want to talk about, and I feel like us as athletes, we're looked at as role models. And I feel like with Colin Kaepernick, he's doing a great job for standing up in what he believes in, and most people may not like that, but that's his opinion, he's entitled to it, and I respect him for doing it." Tavarres is an undrafted rookie out of Incarnate Word. He made the first round of cuts, as the Eagles recently trimmed their roster to 74 players, and is trying to make the team to contribute mainly on special teams.